← Attention shoppers! A blue sky special! We hug goodbye and I climb into the driver’s seat of the Perfect Tow Vehicle. The crew sits on the bench seat behind me. I turn the ignition key and Timber realizes we’re leaving. He jumps and pulls on his leash and whines as if to plead, “Don’t go!” I wish I could tell him he will see Spike and Bridget again soon. The day is clear and windless, perfect for towing. 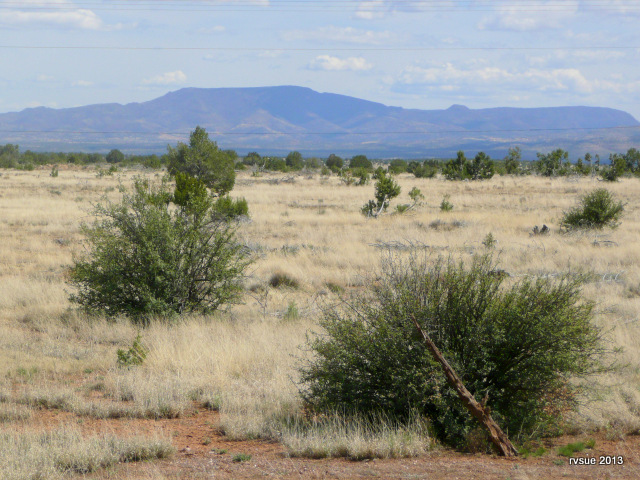 We head west on Highway 169 to Prescott Valley. Never knowing for sure how long we will stay at a new camp, I always try to arrive there well prepared for a long stay. First stop is Safeway. In addition to groceries, I buy ten gallons of drinking water from a vending machine. Next is Many Trails RV where I recently had the toilet flush pedal fixed and the power cord outlet moved to the bumper. It’s on the way. The PTV needs new wiper blades. The service guy goes in the back to see if he has the right blades in stock. Since I try to stay in good weather, I can’t remember the last time I drove in rain. While at Many Trails RV I buy 4.4 gallons of propane for $13.75 ($1.21 sales tax). I empty the waste tanks and fill up the fresh water tank. I put my trash in their dumpster. Gee, this is a handy place. Many Trails RV lets anyone from the public use these facilities, 24/7. I take Glassford Hill Road and turn left onto Highway 89A. Say what you will about highway cameras, they do keep people from driving like idiots. It’s a stress-free drive over to Highway 89 which takes us northward through grassy, tan fields with mountains beyond. I stop and fill up the gas tank — 21.7 gallons @ $3.67 a gallon ($79.78). It’s a good feeling when all these tasks are completed. 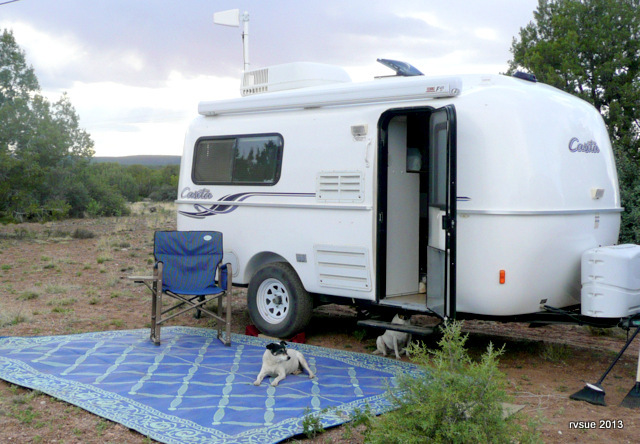 The crew and I set up camp in the Prescott National Forest north of Chino Valley and Prescott, near Drake. Rusty drew me a map to this place. This was his last camp before joining me at Juniper Hill. Late afternoon at Camp Drake. Bridget hides from the camera under the BLT. I’ve stayed in the Prescott area for a reason. Rusty has some exciting news! Rusty and Timber may very well be settled into a regular house soon! 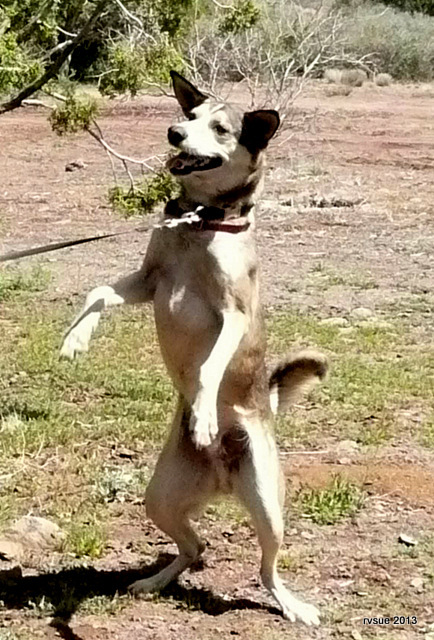 Rusty is at the top of the list with the VA for a HUD home in the Prescott area. He has made it clear to the lady VA rep that he will not be separated from Timber, that Timber is a high-energy dog that needs room to run, and that the best option is a home with a fenced yard. Of course, moving to a permanent residence in a neighborhood is a huge change for Rusty. Some of my readers will identify with the adjustment it takes to give up the full-time vagabond lifestyle. While we were neighbors at Juniper Hill, Rusty struggled with the decision. One day he was happy about the change, the next day he was dead-set against it. Back and forth, his mind weighing the pros and cons. He lost sleep. At times I thought he was going to chuck the idea and stay on the road. That’s why I haven’t written about this until now. It looks like Rusty and Timber will have a house soon! A voucher needs to arrive which may happen within the next few weeks. On Monday, after meeting with the VA lady, Rusty and Timber will join us here at what I’ve dubbed Camp Drake. I slowed our travels this spring not only because of weather. I wanted to be with Rusty during this transition. After many years walking the West with donkeys followed by a time of living in his truck, this is a big challenge. I’m hopeful Rusty and Timber will soon enjoy the comforts and routines of living in a regular house. Rusty talks about planting a vegetable garden, cooking his favorite dishes, having a TV, and sleeping in a big bed. I’m sure those of you who’ve developed an affection for Rusty and Timber are as excited as I am as this new chapter opens in their lives! Note: This post is so long, I’ve postponed the Canine Corner for another time. I know several of you would rather hear from the crew than from me. I promise Bridget and Spike will have their say soon! 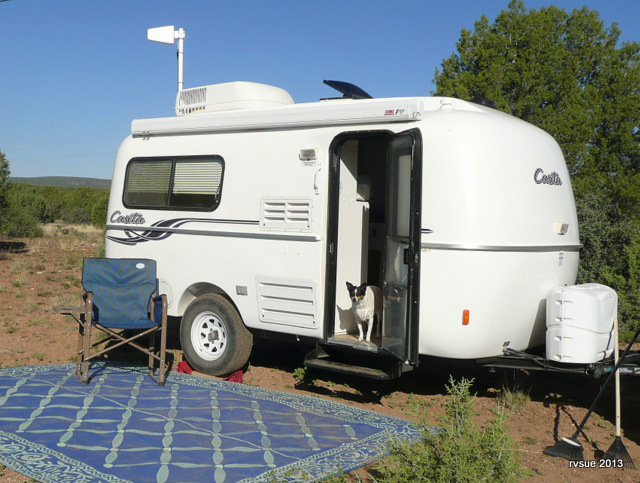 This entry was posted in Simple living and tagged boondocking, casita, lifestyles, National Forest, Prescott, rat terriers, travel trailer, vagabond. Bookmark the permalink. Sue, is there a way some of us could donate to Rusty and Timber to help them settle in their new home? Or would Rusty be opposed to that? I would love to see them comfortably ensconced in this new chapter of their lives. Yes! That would be fantastic, Julie! Anyone who has furnished a new home knows how much it takes…. Rusty will need lots of stuff for a new start. Once his home is located and he has a mailing address, I’ll post the information. Thanks for bringing this up. Great! I’ll be anxious to hear! Thanks. I also was thinking the readers could help him out to set up his house. If we get an idea of what he needs or wants we could donate or perhaps buy items thru your amazon site. Rusty wants to keep his truck. He’s thinking, once he’s settled in his house, he’ll give the ol’ girl a new paint job. That’s how we roll in Oregon…Good People! 🙂 Will be waiting for the address and Congrats to you Rusty and Timber! Julie wrote what I was thinking! I happen to be in North Central Texas, too. If Rusty gets the house, I guess he will have an address. Maybe we can send him stuff. I trust that you’ll keep us informed. Thanks for your blog. A wonderful one. You wrote this before I posted the answer above. I’ll be sure to let you know his address. What great readers I have… you included, Rose! I have to say that I truly hope that Rusty and Timber get a house. As we get older the vagabond lifestyle will slowly but surely take it’s toll on the body. With health issues coming in the future it is a far better lifestyle to be able to settle down in one place to call home. Wishing them all the best. I am sure that Rusty having a friend like you will make that transition a little bit easier. That is a really big change in one’s lifestyle. All the best to you, Bridgette and Spike too. I’m sure Rusty will read your best wishes to him and Timber. Your words are encouraging. Thanks for writing, Bill. I just bought 3.9 gallons of propane for $17.57 (99 cents sales tax). Yikes! Sometimes it’s worth the extra money for the convenience. When I need propane and I’m at a place that sells it, I buy it no matter the cost, just to have it! Ouch indeed! We had paid around $4 per gallon and then found that Tractor Supply Co. sells it for $1.99. It’d be worth it to see if there’s one near you, I hope there is. It is wonderful for Rusty and Timber to have a choice. They can still travel to their favorite haunts when the mood strikes but there will be a warm home to return to when they need it. Helping them set up their home is a wonderful idea. What a great community of online friends through this blog. That’s what I told Rusty when he started to back off the idea of a permanent home. I do pray he gets a home that suits him and Timber. The generosity and caring of this “community of online friends” (love that phrase!) is heartwarming. Rusty has told me how appreciative he is of those who have sent gifts to him since his story first appeared here. I think Rusty & Timber moving into a house & having a “base” will be a good thing. While I don’t know them personally, I get the feeling Rusty may be ready for a little less “difficult” lifestyle … at least for a while. While traveling as a vagabond is freeing and liberating, it’s also a certain amount of specific work, as you know. Sometimes a little stability is welcome — and living in a house (especially one owned by someone else where your financial & maintenance responsibilities are limited) can provide a sense of security … not having to worry about where you’re going to dock for the night, where you can find the supplies you need or the facilities to dump your tanks, upkeep your rig or fix items that break down on the road. Rusty has certainly put in his time as an intrepid, adventurous “wanderer,” I hope he enjoys this new chapter in his life. If not, the road is always right there outside the door! Cheers & Good Luck, Rusty & Timber. Great message, Sherry! You make several good points. Wishing Rusty and Timber the best of luck with the new chapter in their lives. Great pictures of the new camp (and finally Bridget..lol). Immediately before that photo of Bridget hiding under the BLT, both she and Spike were lying in a perfect pose on the outdoor rug. I go to take the pic and she’s scooting behind the step! I wish she would get over her camera-phobia. Me too, she’s such a cute girl! Nice comment, Geri. I’m sure Rusty appreciates your friendship, including the homebaked cookies! Sue,can you let us know if rusty will need items for his new house,I don’t live too far and have been downsizing, would love to give to him. I’m sure Rusty will need several items. Anyone furnishing a house needs lots of stuff! I’ve been thinking about how to handle this situation, with so many folks wanting to give house-warming gifts. I think I’ll have to make a list (like a registry) of items… or at least ask that people let us know what they are sending so he doesn’t end up with twenty-seven crockpots! Ha! I hope you can hold on to the stuff you’re downsizing until we can share an address. Thank you for your thoughtfulness, R.J. Happens all the time, this is such a dynamic comments section (ooh, bragging again!). Pat, Rockhound State Park, NM. So true, Pat On behalf of Rusty and Timber, thank you. Many Trails RV sounds like a wonderful establishment. No snakes in this area?? Can the crew roam around freely? I am happy for Rusty and Timber. I told him…any sort of “change” will make anyone apprehensive but he can always do what he enjoys if he feels the need to. It will all work out…give it a minute. For you to see him through this transition is absolutely heartwarming. What a wonderful friendship/bond you two have. Timber will be excited once Rusty rejoins you! Shopping for housewarming gifts….I know just the place or err the link. I have an idea….during one of your upcoming camp chats….perhaps Rusty can make a list…kind of like a registry.. you can create another drop down section….once that item is selected…it can be crossed off by making a notation in the comment section. Gift cards, so he can have fun too..would also work. Just a thought/suggestion. I have an off the topic questions for ya….Do you know how much the BLT weighs with all your stuff in it? Brilliant minds think alike… well, they don’t really, but anyway… I was thinking about a page from the header, too! Then hope that everyone lets us know their gifts and checks it before buying anything. What fun! No, I don’t know how much the BLT weighs with stuff in it. The PTV pulls it with ease so I haven’t paid attention to it. Re: snakes… I drove up and down several dirt roads in the area before setting up camp. I wanted to know the area. I also walked with the crew on-leash. No sign of any snakes (although I’m sure there are some). There’s a lot of activity around here… a cement plant, drilling and blasting in a quarry, trucks on the road… I’m hoping all the activity makes this a place that snakes aren’t comfortable in. It’s very open here, and no rock piles. I tried to find that spot via Bing Map when Rusty was there. I was lost somewhere on the internet in some forest. Your site is saved to my favorites….now there is a little picture of you with your desert hat on! The easiest way to find a boondock is to look at the National Forest maps (Prescott National Forest, east section). Ah, the desert hat. I don’t feel completely into RVSue-ness without my hat on! Great news about Rusty and Timber. In December and January Paul had both hips replaced. During that period we definitely needed the comforts of a house. And for medical issues a home base and doctors who know your history definitely useful. Medical issues seem to arise a little more frequently the longer we’re blessed to be here on earth. Having a home base will give him the option to sleep in and relax or “run away” and camp. Besides, air conditioning is really nice when it’s gazillion degrees in Arizona! Not to mention running water! You make good points. There’s an excellent VA medical center in Prescott. Rusty’s been invited to visit there and eat meals with fellow vets. Yae! for Rusty and Timber. He may enjoy it and if not , they can always take to the road again or just take to the road now and then. That’s right! Now he has choices, depending upon what he feels like doing. I purchased propane tank cover’s for my (Casita,and Argossy) from Amazon yesterday and was hoping to add a couple of “Happy Camper” key chains (listed on your shopping links) to my order at $3.50(?) each, but Amazon says they needed to be ordered separately from the mfg ‘Zazzle’ who charges $9.50 shipping.. needless to say, I can do without the key chains at that price. I do not know if you will receive credit for my $50 Amazon order, as I needed to do it independently from your blog. Still don’t quite understand your relationship with Amazon or how it works to get credit to you for items purchased. Also, what is that antenna (white) sticking out of the rear on the photo’s above (info about the mfg, cost, etc?) …thanks. More questions coming…. Re: how I get credit for your Amazon purchases. Each of the Amazon links I post has embedded code which includes my Amazon Associate number. Anything you buy through one of my links, I get credit for. Re: the key chains. Thank you for that info on shipping. I will look into it and remove them if there’s no way to avoid that shipping charge. I appreciate the feedback. I’m curious why you had to order the propane tank cover “independent” from my blog, but it really isn’t any of my business, so I won’t ask! Feel free to ask questions. It’s my pleasure to answer them. Great news for Timber and Rusty! I would love to buy them a gift for their new house and I could do it through your Amazon link. Not related to this post but just had to tell you this story about all the folks that read your blog. I work 2 days a week for a major rental car company as a transporter. I pick up customers and bring them to the office to get their cars. Last Thursday I picked up a couple at an RV park and we visited on the way back to the office. Can you believe that not only did they follow your blog, but had met you! It was Gary and Sandy who I have seen posting on your site. Talk about a small world! Thought this might make you smile. Isn’t that something! Ha! I hope I’m remembering the right people… I met them when camped near Barstow, CA. Probably I’ll realize I made a mistake once I post this comment. My memory is terrible! You experienced firsthand the same feeling I get when someone recognizes me in person. A small world indeed, due to the internet. Yes, you did make me smile. Hold off on buying Rusty a gift until we can coordinate gifts. Sweet of you to want to give and to shop via my blog. Could we make the purchases through Amazon? Sure, you can! Please let me know what you purchase so I can help us avoid duplicate gifts. I’ll list what’s been purchased. Anybody who doesn’t want people to know their gift can use an alias when logging on. Thanks for asking that question, Ladybug. Well, great news about Rusty and Timber. As an old dog with medical issues myself, I appreciate the permanent address way of life now. It has it’s perks and in my case I still get my little taste of the outdoor experience through you here on your blog. I know Rusty will face a period of transition but ultimately I’m sure it’s for the best. He has paid his dues for a full size bed and a patio and BBQ grill. I certainly pass along my wishes for his happiness. Hi Bridget, Spike and of course my favorite (and only) travel hostess, Sue. I’ll be watching for developments with Rusty. I’ll keep you up-to-date on developments. Pray that everything goes smoothly. We’re dealing with a bureaucracy here, but so far the VA has been great. Oh Yippy Good News and we hope to meet Rusty and Timber someday. I like the idea of them having a home base and when they want to return to the camps, they can take a few days and do so! Rusty and Timber will have the life of both worlds, that’s awesome. Here’s and idea….. Amazon has a wish list. There is a way to set that up so the wish list is shared. My daughter did that when she was expecting the baby and when I wanted to “baby shop” I checked her wish list and bought items she had selected. Maybe Rusty could create wish list on Amazon. Anyone who has an item that is on the WL they plan to give then Rusty or perhaps you Sue, could make note and remove the item from the wish list. Just a thought. Bridget…so cute. And Spiky looks exhausted from setting up the new camp. Happy to hear all are well… Have a great day and time at the new camp. That’s a great idea, Kay. I have one concern though, and maybe I’m being too cautious (I want to keep Amazon as long as I can). Amazon does not want purchases to be promoted among family and “friends.” The definition of friends is a hot topic on the Associates discussion forum. Associates have lost their status over this. Even over friends of a friend. I’m wondering if the wish list would have this effect since Rusty and I communicate by email often, thus linking him to me as a friend. I don’t mind keeping track of everything here. And really, since he’s going from a truck to a house, there are many, many items that are obviously needed. Like you wrote, I “could make note and remove the item” from a list kept here on my blog. Yeah, the crew was wiped out last night, slept like stones (shaped like dogs). With the way of the internet and social media. I don’t think so. I would suggest a call to Amazon Customer Service for “Associates” and talk directly to them. Of course, document who you speak with and the date and time. I can’t imagine how any of this would affect you and your Amazon account, I say this based on the conversation I had with Amazon Customer Care in the “Associates” department. I know the Wish List worked very well for my daughter as all of her friends and family are hundreds of miles from Oregon and people just went to her Wish list and made purchases based on what she listed as needs. Some purchased items from other places, and they emailed her to let know. She then removed the item from the Wish List. You’re right about being comfortable in the RV. There’s a reason I have to make some changes for the comfort of my son. Boon docking is our goal as I have never been able to let him experience such a simple life experience before. The idea is that we will spend at least one night a week at a full hookup to deep clean, do laundry and take care of the holding tanks. Taking my suburban will allow us to do the 4WD areas for sightseeing. Taking OCD ADD Rowdy is my most challenging given his toddler stage in life. He loves other dogs, and at the sight of one, he’s off and running faster than a sneeze. My thought is to have his leash on with a long rope attached to it so when he sneaks out the door in a flash the most he will get will be the length of the rope. Still thinking on this one. At the risk of sounding like a stubborn son-of-a-gun, even after a conversation with an Amazon rep regarding the “friends” issue in the operating agreement and in practice, I’m still hesitant. What is said and what actually happens doesn’t always coincide. I read the Associates forum and the actual experiences of fellow Associates cause me to be cautious. We can accomplish help for Rusty and Timber without an Amazon wish list. To readers… Please do not call the Amazon Associates department on my behalf, no matter how well-intentioned. Once an Associate is kicked out by a “robot,” there’s no getting back in. BTW, I talked with Rusty about Amazon. He’d rather have gift cards to stores he can walk into. The VA has been good to me. I glad Rusty is getting his just due.. Good luck to him and Timber in thier new home.. The Prescott office of the VA is working to do right by Rusty. The lady he communicates with is very helpful and obviously cares. She wants to help him find a home where Timber will be happy, too. Any delay may be the fault of the mess in Washington which indirectly could hold up Rusty’s voucher. That’s great news for Rusty. Sure hope they can find a house with a yard for him and Timber. First thing this morning I rushed outside with the camera and waited for her to appear in the door because she always follows me around. What a noodle-head… after all this time, she’s still camera-shy. Sue, I like the idea that your readers had about a registry for Rusty and Timber. I would like to help out, too. As a regular follower of your blog, I realize how difficult this decision was for Rusty and wish all the best to him and Timber! I’ll set to work on a Rusty and Timber registry right away! This sounds perfect for Rusty & Timber. He can have his Bug-Out-Vehicle all stocked and ready to go for whatever whim hits him. Just hope he isn’t tied down by government rules and regulations. He has lived the life of a free man for so long, I hope this new way of life doesn’t cramp his style. No matter what we try to do…we are possessed by what we possess. The more STUFF we have the more complicated our lives. If I gave him a gift it might be something in the way of backpacking. He could then have a Bug-Out-Bag too…just in case. He now has room for sitting in front of the fire place at night and making a Bug-Out-Bag for Timber too. Timber could carry his own food in a little doggie pack. As much as I hate the thought…maybe Rusty could have Timber tagged with an implant showing that he belongs to Rusty, with phone number, address ect.. I think Rusty is considering a chip for Timber. He’s wary that Timber might dig under a fence while he’s gone. This way of life won’t cramp his style! Please don’t give him reasons to change his mind again. He can hit the road again whenever he wants. The gov’t. won’t be putting him under house arrest. A home base is something many RVers enjoy. There is such thing as windshield wiper covers to put on when baking oneself and one’s car in the sun or applying masking tape to cover them. And THAT is the alpha and omega of my technical road knowledge. I hope you can eavesdrop on B. & S. to hear what they think of Timber leaving the road. “That lucky dog”? or “Thanks for the idea, but not now.” I’ll bet my last propane bottle that it’s the latter! I should protect the wipers. I have a dash cover that I bought two years ago and I think I’ve used it twice, ditto on the wheel covers. I’m terrible about stuff like that! I get settled in a new camp and immediately want to play . . . I think the crew enjoys the vagabond life. Unlike Timber who stays tethered due to the tendency of his breed to run off, Bridget and Spike have more freedom than when they were at a regular house. BTW, never bet your last bottle of propane! It’s too precious! Oh take the time for the dash cover and the tire covers! The sun will dry rot out your dash as well as your tires. Tires are expensive! We put covers on the windshield wipers because they will melt on to the windshield. The sun in Arizona is just brutal. I’m pretty excited for Rusty and Timber, the new house is going to be good. Thank you for your friendship and support to a veteran. You’re welcome, Allison. You’ve motivated me to get out the dash cover and the wheel covers first thing tomorrow! That is something I never heard before. I lived in Phoenix for 14 years with the car parked out in that brutal sun for all that time and never had a wiper melt on the windshield. That was way back in 1968-1982 so maybe they made better wipers back then – who knows? Sue, I am very close by! I am looking right at the Drake cement plant from my camp on the West side of 89 off FR 573. Feel free to drop by if you want, there is a pretty good map on my blog. I am leaving Monday for 2 weeks in Florida visiting my mom, but there are 4 other people here (2 men, 2 women) I think you would really enjoy meeting them, they all live full-time in vans. Charlene is 69 and has kayaked all 48 lower states and is header for Alaska this summer to kayak it, Hawaii will be the 50 th state next year on her 70th birthday. Wonderful folks! Wishing you all the best in your travels!! This is my third try at replying to your comment. The internet around here gets iffy in the afternoon! I figured you were close by when you said in your email that you were “30 miles north of Prescott.” Charlene sounds like an outstanding adventurer! In fact, she sounds familiar to me… maybe I read her blog? Let me take this opportunity to wish you well on your cruise with your mother. Have a wonderful time! I checked the National Forest map and realize I was on your road yesterday! I didn’t go very far because of the warning of impassable after rain. I was told there are some really nice spots back in there. I hate how people have thrown trash around the first part of the road. I’m sure it’s fine where you are. It seems like most forest roads are used as a dump at their entrance. Congratulations to Rusty and Timber. After reading the comments, I wondered why one needs to cover a propane tank. I realize it probably sit outside, but is it to keep it cool, prevent rust etc? Well, for one thing, it covers the dorky looking tank(s). Maybe it prevents rust. I never thought about the “why” of a propane tank cover. It certainly doesn’t prevent theft. At least the tanks aren’t sitting there exposed, saying “steal me” to thieves. Look at the photo of the BLT. It would look pretty dumb to have the two tanks with the propane connections showing. Interesting question, Kristine. Maybe you could make an Amazon wish list for him and we could order from there? Or is that to iffy for Amazon? I’m nervous about an Amazon wish list where everyone enters through my blog. Good news about Rusty and Timber. He deserves to have a safe and comfortable place. But I bet the wanderlust he feels will make it difficult to settle down. Still…there’s no rule that says he can’t travel. And going to eat some meals with other vets could be a really good thing too. Hugs to him, and to you for sharing his experience with him. Always good to go through stuff with a friend near. It was a big adjustment for Rusty when he gave up his donkeys and moved into his truck. He’s a resilient guy. I’m confident he will adapt well. A flush toilet, a refrigerator, running water, electricity, a larger bed, a stove, an oven, a heater and a television are some of the things that will help make the transition easier for him. Yea . U are so kind sue the world needs more of u. Well, Rob, truth be told, I can be selfish. I choose not to blog about THAT. Thank you anyway. That’s great and exciting news about Rusty and Timber. I know he must be a little concerned about “settling down,” but he will still have the opportunity to travel if he gets the urge. That’s what I plan on doing, keeping my house and then traveling part-time. I, too, would like to help him furnish his new home, and I’ll be waiting to hear more details. Thank you, Cari. No, I never imagined my blog would become so popular. I started it for a record of our travels and kazam! It took off! Now I realize our full-timing experience would be diminished if I didn’t have this “community of online friends” to turn to and to enjoy. I never imagined retirement could be this fulfilling either. This blog satisfies the urge to teach… which never goes away for those of us who loved teaching… (but hated the bureaucracy). Rusty is a good friend to me, too. That Timber is a whole lot of dog energy. It is something to see, the way Rusty handles him and shows him he is loved. I appreciate your thoughtful comment. I got excited about shopping and forgot to congratulate you on your 500th post! Getting Timber a chip is a great idea. Rusty, originally per Scott Craven, thought it caused cancer. I told him it was the size of a grain of rice and all of my four legged critters have them. The info ie house, phone etc can always be changed in the system. I would think Timber would be a jumper AND a digger. Maybe you can reassure him they aren’t harmful to our beloved pets. Rusty can put his cell phone number in…and update the address at a later date. On behalf of Rusty and Timber, thank you! Is the crew “chipped”? Maybe it can be an outing for ALL! Thanks for the congrats! Yes, the crew is chipped. I had that done as one of our preparations for going on the road. Big CONGRATULATIONS on your 500th post. We all really enjoy your post and appreciate your hard work in putting it together. And I appreciate you telling me you enjoy my blog, Don. I’m amazed to think I’ve written that many posts about my little life with two dogs. Talk about self-centered! Haha! Thanks for the congratulations. I’d love to do that, Dave. One big reason I hesitate… I don’t want to be accused of using the funds for myself. 99 percent of my readers wouldn’t dream of doing that, but there is the tiny percent that would do that… You know, the trolls that come out from under the bridge. That’s why I’d rather people send gift cards. I’ll make up a list of local stores that Rusty wants to shop at… stores of all types. You’re welcome, Dedra. And thank you for caring! Betty from Milwaukie Oregon here, Congratulations on our 500th post. You have helped so many people on here. I am looking forward to what ever you come up with for a registry of sorts and will also contribute to rusty and Timbers new to them home. I would think even a gift card from a grocery store clsoe to him to buy Dog Food for Timber. On Monday or Tuesday, when I can sit down with Rusty again, I’ll have him help me put together a list of Prescott stores, including a grocery. I know he likes the Wal-mart in Prescott. I’ll post all the details for my generous readers like you, Betty! Thanks for the congratulations, BTW. Your blog today warmed my heart and made my day. Thank you for that. I’m very happy for Rusty and Timber and more so, that you’re keeping an eye on them. They’re very blessed indeed! You have a beautiful day and pleasant evening, too, Lacy. I appreciate your comment. Congratulations Sue! 500 wonderful posts! Thanks, Crazy Carrie. I’m hoping, as are you, that Rusty and Timber find they like this new way of living, without giving up a lot of the old way. Thank you. I’m grateful to still have readers after 500 posts! Thanks for the wish, A. G. G.
Thanks for the congrats. “The best of both worlds” — Rusty deserves that! Good luck with your plans. Cheers back to you in Canada! What wonderful news about Rusty and Timber. Will be waiting for information on what he needs and where we can send it. Can you believe the wonderful people on this blog? Thanks to you, too, Pauline for wanting to help. Love you! Just some ideas to get our list started for the smaller things Rusty may need. I was thinking about this, even though these items may not be costly individually they sure do add up fast when you move in to a new place and have to purchase them all at once. I know just where you are Rusty, I had planned on boondocking the rest of my life, now my health is failing and I have to at least find a piece of land to stay parked on close to town. I am just grateful for this blog Sue because although my plans have changed I can still enjoy watching you live yours. I thank God my life will still be pretty simple though, I am grabbing a small piece of land in Joshua Tree California, all I have to do is pull the motorhome on and park it. Bless your desert-loving self, Bob! You saved me some work… and the list is in alphabetical order, too. When I make up a page to keep track of gifts, I’ll copy and paste this list into it. You’re right. The small things do add up. I read on your blog your search for a desert home. I wish you much happiness there and I’m glad to hear you’ll continue to read my blog and be a part of the group of good folks who gather here. Bob, I pray good health for you. I’m very happy to read about Rusty and Timber getting a house. My husband and I live in Phoenix with an extremely active dog we’ve had about 3 years. She is greyhound/pitbull mix. If we don’t take her for a run every day she is difficult to live with. My husband rides a bicycle, and she is on the leash beside him. She literally pulls him for a couple of miles before she settles into a jog. Congratulations to Rusty! 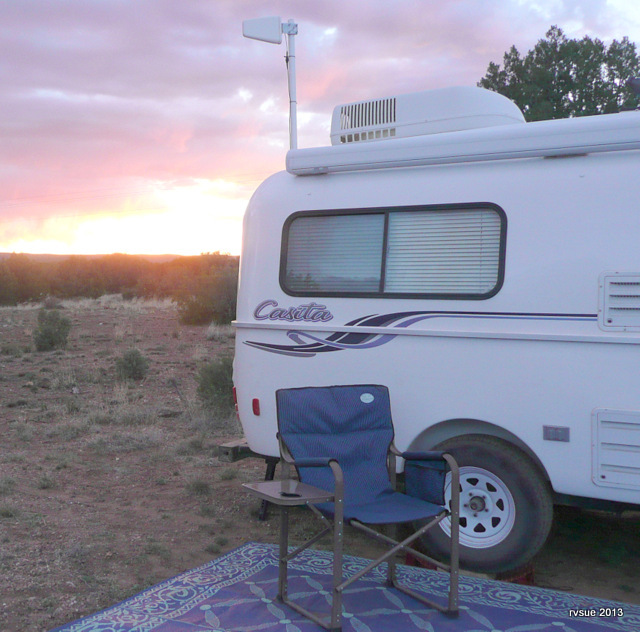 There are lots of great camping places around Arizona he can visit when the mood strikes. Rusty and I talked a little bit about maybe Timber going to the dog park. At least with a fenced yard Timber could run around some. Arizona has been Rusty’s home in the colder months. Even so, there are so many great camping places, like you said, that he can discover and enjoy. Are you sure you can’t bring it up here? antenna on your blog, and the off grid solar system you have set up. Interesting reading, thanks. RV catalogs and ended up going directly to Amazon to order. I sure made a mistaken detour,…. sorry. I am outfitting my used 16 ft Casita, so I’ll remember where I should be when I shop next time. TV will fit on those brackets, and do they make combo 120v/12v Tv’s anymore? I have not seen any TV option mentioned in the RVsue blog and was wondering what you chose? do you feel you need to vent the inside of the camper to fresh air when using one? I didn’t choose my TV. It’s the TV that comes with a new Casita if you choose the entertainment package. My TV is a COBY. It is not a 12v. My Casita has 12v outlets. I plug my TV into an inverter that is plugged into a 12v outlet. My TV hangs from one large metal bracket that allows the TV to swivel, side-to-side and up and down. It is absolutely necessary to vent the catalytic heater. I open the bathroom window about four inches and leave the bathroom door open. Then I open the ceiling fan vent about four inches. This allows for good air flow. Also, you MUST have a carbon monoxide detector. Speaking of where is Rusty??? Yo Rusty………….can you feel the love? Yes, Rusty most certainly can feel the love. He emailed me in reaction to all the caring comments here. In a word, his reaction is WOW! I imagine so many comments are overwhelming, as far as responding. Only a nut like myself would do that! Hopefully it tells you somehow you’ve got an update or post. Trying being on this side…I’ve scrolled through this post a zillion times trying to read and re-read all the updates. You my dear are going to be up all night! As for Rusty liking Walmart….and browsing around the store…Walmart online also sells big items like mattresses (did I spell that right), refrigerators, beds, dressers….that aren’t on display at their stores. Kind of like a one stop shop! I would guess that if he had his place right this minute…his place would be furnished by the morning. Glad he’s on the top of the VA’s list. Right now? You bet-cha, Wash tae!!! Ahoh!!! BIG CONGRATS to Rusty & Timber!!!!! I hope they get the house & yard that is just perfect for them. I totally agree that Timber should be chipped. Sometimes a local Humane Society or animal shelter will have a “microchip day” where they will chip pets for a reduced cost. I’ve also heard it called a “Pet Health Fair” where you can your pet to get chipped as well as have a general check up at a very reduced cost. Hopefully, there’s something like that in Rusty’s area. Congrats to you, too, Sue on your 500th post! I’ve appreciated every one of them! Thanks for the congratulations to me, and to Rusty and Timber. Hello, Dixie! Nice to hear from you again. Congratulations to you on furnishing a new place. I’m glad you had a chance to meet Rusty and Timber when you visited Juniper Hill Camp, even if you were rained upon and almost blown off the hill! I think Rusty will need big items the most i.e. a nice bed, kitchen table & chairs, a couch & easy chair, maybe even a nice LED TV. If donations climb high enough, the money could go towards these big item purchases. The big items are more expensive to buy as a single person but with the help of others i.e. cash donations it will be more affordable to buy a bed & mattress and other big item goodies. The donation site can stay up for some time so that he can buy yard equipment later on for his garden and to maintain his yard. I think Rusty will enjoy a warm home, a garden, cook, and he can drive out into the boonies to walk Timber and get out of the house. Prescott is a very nice location for Rusty and Timber. He can go camping any time he wants in the area. And, he can still travel distances if he wants…but gas prices are kinda steep now. I think everyone is excited for Rusty & Timber. They have many friends from reading comments above. When Rusty and I get together, we’ll put together a list of stores for gift cards, including a store that sells reasonably-priced furniture and appliances. I’m hoping he gets a place with washer-dryer hook-ups. I’ll keep the page up for several months. You are very thoughtful, Rita. It gives the venting answer on page 6. Carbon monoxide is not an issue but any heater zaps the fresh air and a lower and upper vent should be slightly opened during use. A good carbon monoxide detector from Amazon can give people peace of mind, though it is not needed for the heater you advertise. When I first started using my heater, I tried opening two windows. Apparently it didn’t cause good air flow as the carbon monoxide alarm went off in only a short while. The heater does consume oxygen and apparently the CO alarm detects that deficiency. wow 🙂 I feel it. That is so cool. Making friends out ‘here’ can lead to the neatest long term relationships. Good for you Sue to hang there for a bit of moral support. I really haven’t done much, just listening, and fielding all the loving reactions of readers here. What a great post and pics! Thank u Sue for all ur doing for Rusty and Timber-so many people don’t respect our vets, it’s wonderful to see the compassion u have for both of them. Isn’t it sad that the nasty 1% have to ruin things for people but u r so right about them. Those of us who have been following ur blog know that u r an honest person and that never enters our minds. I’m praying the Rusty’s transition is smooth and that Timber enjoys his new home. Rusty has had much adversity in his life but also much joy and seems to have great resiliense (sp). Please tell sweet Bridgette that she is beautiful and to let u take her picture. lol Thanks again Rv Sue for all u do! You’re welcome, Judie. I’m also praying that Rusty and Timber make a happy transition to their new residence. I’m hoping people will be patient and not buy gifts until the move is certain and the house is secured. Hi Sue, I see that other readers thought about it… we are downsizing our house and have quite a bit of stuff to spare… kitchen items, blankets, bbq… the list could be long. I planned to give to St Vincent de Paul because they give the stuff to people in needs. Not like Good Will to whom I’ll never give anything again. We are in Phoenix and spending week-end between Cottonwood and Camp Verde. Prescott Valley is in our neighborhood. If Rusty needs something, please let me know. I am sure I have it 😉 I think you have access to my email via comment. PS: hugs to the crew! That’s very thoughtful and generous, Patricia. Unfortunately this weekend is too early. There’s always a possibility Rusty won’t have a house for several months. The earliest would be May 1 and where would he store the items in the meantime? Thank you for your offer. We have to wait until a house is located and a lease is signed before accumulating furnishings. Congratulations on your 500th. blog Sue and for giving us such good news about Rusty and Timber! For all the small stuff that adds up so quickly a Wal-Mart card would be a good gift idea. You can buy so many different things there that after the big stuff is taken care of I think you could outfit a home from there, one stop shopping! Thank you for being such a good friend to Rusty, all our VETS need someone like you to give a helping hand when they have a need. Thanks for the congratulations, Karen. Rusty has already been cruising Wal-Mart looking at kitchen, bed, and bath items. I know he would want to get his TV there. As much as I love getting Amazon commissions, I have to be honest and say that Wal-Mart gift cards are Rusty’s favorite. The super Wal-Marts even have some furniture. Thank you for your service Rusty! I have a lot of military folks in my family so have a special place for out Vets! Sue, it sure is fun reading about your adventures. I have traveled a lot of the roads that you are driving on by bicycle and hitch hiking. I visited Arizona on a hitch hiking trip in the Winter of 1979 with a good friend. We started in Minnetonka, Minnesota and made it all the way to Nogales. Reading your blog brings the memories back. I can see where my blog would bring back the memories of that hitchhiking trip. I’m glad you have fun reading about those same places through the adventures of me and my crew. Nice to hear from you, Mark. BTW, I live in the Bay Area of California. We are planning our month long stealth van camping trip and I am reading your blog to see how what methods may work for us. When I traveled cross country on my bicycle, I camped in city parks and just about anywhere that I could slip in unnoticed. Unfortunately, this will not work in our van. You are giving me enough tips to realize that we can still camp all over the US for free. Amazon is a great way to supplement your income. We do most of our camping purchases there. Have you ever heard of Stovetek wood burning stoves? It burns sticks and twigs. Free fuel for you and the crew. My wife had me buy one on Amazon and we have used it on the past 2 camping trips. It’s just as fast as my Coleman dual fuel stove. No, I haven’t heard of Stovetek stoves. I’ll look into those as a possible item to add to my Shopping Links pages. As for me, I’m kind of fond of my propane stove inside the BLT. I’m all for the simple life (up to a point 🙂 ). Not necessary to be stealthy in our public lands… BLM and National Forests and some National Monument areas. Good luck and have a fantastic month-long camping trip. I just realized Andrew and Mark are the same person! There are so many comments, my plans are lost in them! Yes, Eileen, I plan on making a “wish list” page on my blog. People will be able to enter Amazon from a link on my blog and order the gifts, having them shipped to Rusty’s house. Of course, people are free to buy gifts from any store they wish. Some people who are downsizing want to give their good stuff. All this must be coordinated so that Rusty isn’t burdened with seven sofas, for instance. I will ask everyone to report what they ordered (either under their name or an alias) and I will try to keep up with it, putting a check next to each item on the wish list that a person has purchased. I will also ask that everyone look at the list before ordering a gift in order to prevent duplicate gifts. I will not post a House-Warming Gift Page until it is absolutely certain that Rusty and Timber are moving into a house and have a lease. I don’t want people buying stuff prematurely. “Grow old gracefully” is the advice we hear. Growing old is easy, the ‘gracefully’, not so much. I sympathize with the yes/no dilemma of Rusty and Timber. 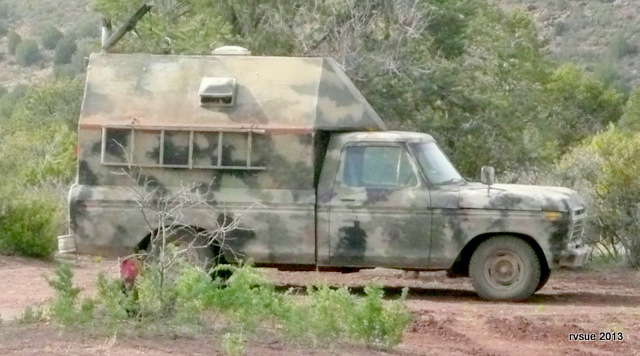 I gave up my motor home in 2011 telling myself, it cost too much of my SS to maintain and still have money to travel. Why just pay storage on it? I thought I could survive just living in a Senior Mobile home park for my last days. NOT! In 6 months I scraped up to buy a used travel trailer so I can make at least short jaunts in my home state and get away from the issues of living close to old neighbors who only want to gossip and play bingo. Its my guess having close neighbors will be hard on Rusty’s need for solitude. Excellent ideas are coming forth to help Rusty and Timber settle into a permanent home. I hope he can continue to ‘get away’ when the settled life gets to be too much. Rusty is keeping his truck so he can “get away from it all” whenever he wants. The house will be under a one-year lease, so he does have the option of going back to living in his truck. Moving to a residence has been a difficult decision for Rusty, but now that he’s made it, let’s encourage and support that decision. Rusty loves people and enjoys talking with them. He may take to living in a neighborhood and being around fellow vets like a fish put into water. Wouldn’t that be grand! i’m so thankful for you and rusty~the world is a better place with both of you in it! if there’s any way i can help, keeping a list or whatever, feel free to give my email. Thank you, Mary Ann! I appreciate the offer. Let’s wait and see how it goes. Hi there Sue n Crew! Congats on your 500 post! What exciting news for Rusty n Timber and so kind of you to help them with their transition to a new home. If Rusty is not adverse to gently used furniture, I have an oak n white ceramic round kitchen table w/leaf and 4 chairs and a microwave oven. We are just down the road from you(in our sticks n bricks for the summer) off of Verde Ranch Road. If Rusty is interested and would like to see the table (we’ll keep in storage till he has his house) you have our email so we can exchange phone numbers with Rusty. BTW Sue, while you are in the area and need water or to dump your welcome to come by here if you’d like. Thank you very much, Vicki! How very thoughtful and generous. I guess the best thing to do is to wait until Rusty can look at his house and his eating area so he knows how much room he has. It’s great that you will be in the area for the summer and nearby! I’d like to avoid having Rusty deal with coordinating gifts. He needs to focus on getting himself and Timber settled. He may be inundated with phone calls and it could get confusing and difficult trying to prevent duplicate gifts with information coming to two people. For that reason, once we “officially” begin accepting gifts (which I will keep track of and report on this blog), arrangements can be made with the folks who are downsizing and/or have items to give from their homes. Please remind me, Vicki, when we are ready to accept gifts. Thanks! As always I enjoy your post and the help you are giving Rusty. Rusty will need you as a friend in the next few months as he changes his life style and I think it is great that he will have the best of both worlds. A stick and brick home and the ability to go roam around in his old home.. Welcome home brother and dont ever forget that you have a ton of folks that care about you. RUSTY…. BE SURE TO READ RON’s COMMENT TO YOU (above). Ron… I’m very hopeful for Rusty. Moving from the truck to a house is a big step, but thankfully it will be a rental. The fact that it’s a rental is so much better than home ownership which is a huge responsibility with headaches. The VA has offered Rusty many benefits he can use once he’s in a VA – HUD house. It’s probable that Rusty’s house will be near a bus stop where he can travel for groceries and to the VA, etc. in the winter months, not having to drive in snow. Medical care, routine and emergency, is nearby, along with a pharmacy. He will be able to have lunch with other vets at the VA two times a week (no charge). He will have access to activities and organizations, including a church if he so desires. He will have a landlord to take care of things that need repair. He has a VA advocate only a phone call away whom he can ask questions or visit. There are many other benefits that I won’t list here. And like you pointed out, Rusty has “a ton of folks that care” about him. Thanks for writing, Ron. This post is simply amazing! Rusty you are truly blessed! When I lived in Trout Lake, Washington at the base of Mt. Adams, at the end of May, folks would say, Winter’s a comin, it was real hard to grow Corn there. Going to bed tonight I will be saying a prayer of thanks for knowing that angels walk this earth. Well, camp on this earth. Congratulations on the 500th post, and Congratulations to Rusty! I can just imagine the FedEx, UPS and US Postal Service will soon be on a first name basis with Rusty and Timber for all the packages arriving. Christmas everyday! I do agree Sue, a wish list here is probably the best plan. I found your blog while researching rv’s. My dream is to do exactly what you are doing in about 5-6 years when I retire. I was so excited to find your blog that I stopped reading the new entries and started reading from the first day. What an exciting time for you. I lived out in Colorado for about 15 years and camped all over out there in a tent by myself. I smiled when you visited an area where I have also been to. I mostly stayed at State or the National Parks, not knowing anything about boondocking. I loved it, I love being out in nature. Its a feeling that if you do not experience it, you just can’t explain it to others. Right now I live through your adventures and hang on every word. I have learned so much from you and have started a notebook on things I need to remember and places that I must visit. I want to congratulate you on your 500th post and I look forward to many more. I have been following the news about Rusty and Timber, how exciting for them. I await more news like everyone else. Thanks again, Sue. Is over 200 comments a record too? Be ready for high winds today!! Many great uplifting comments. Congratulations Timber and Rusty on your upcoming new journey. Make it exciting! RvSue and crew, i like your idea of waiting with any gifts or gift cards until for certain Rusty and Timber know when they are moving to the new house and what they need. We had a friend who got VA housing in another part of the country and his apartment came with all appliances, bed, dining table, chairs, towels and even dishes. I don’t know if this is a standard procedure for all VA housing but lets wait.